Yes indeed. These moldy buggers have been de rigueur in games for some time now. Hardly worthy of a place in the hall of fame that is the VgamerZ Monster Files, you’d think. And you’d (generally) be right, if a little cynical. In this instance, though, we’re going to have to make an exception. 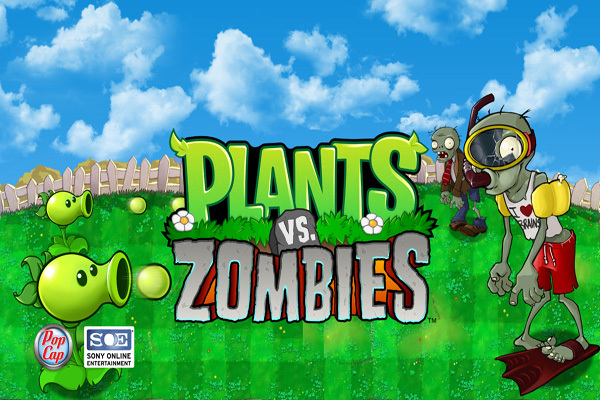 The undead of Plants vs Zombies are different. They’re adorably toontastic, they have a zombie yeti in their ranks, and some of them can bungee jump. Some of them wear some rather spangly suits, like the fashion gurus they are. In short, these guys are just far too cool. This is zombies as they should be done, right here. Presumably, you’re familiar with the game. PopCap’s 2009 tower defense title was a real phenomenon, for dedicated gamers and dabblers alike. It all came from one brilliantly nutty concept: what’s the most ridiculous way to repel an encroaching horde of zombies? By throwing your angry anthropomorphic plants at them. Obviously. These guys are you last line of defense, and the only thing that stands between the horde and your sweet, sweet juicy brain-juice. Fortuitously, they’re more than up to the job. You place plants of various sorts into any spare square on the lawn, and they’ll (generally) fire projectiles at the shamblers. It must have been a riot to come up with the 50+ type of vicious vegetable, which vaguely pertain to their real-life counterparts. The squash, for instance, is a a chunky, grumpy looking dude, which will leap into the air and ‘squash’ opponents that blunder into its range. The peashooter, meanwhile, is a little turret that shoots peas. You get the idea. But the real stars of the show are the zombies. When you see the flag zombie that leads the charge during the final waves, you KNOW something is about to hit the fan. 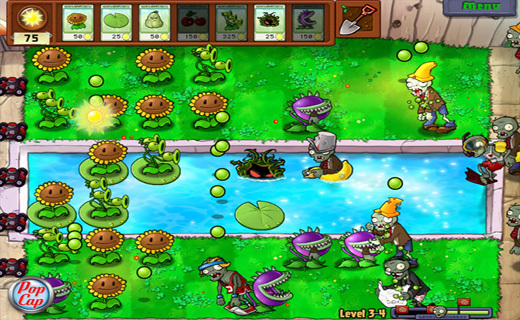 There’s a great balance about the plants and zombies, with each new variant of opponent comes a warrior of your own to counter it. The miner zombie is immune to most of your attackers, as it tunnels beneath them first and eats its way through your ranks from behind. Just as he appears, though, you’re given access to a special mutant peashooter which can fire in both directions. It’s precisely this aspect that makes the game’s undead so memorable. The guys in the football gear, the bobsleigh team, the dancing Michael Jackson-alike who was hastily changed to generic-disco-dude-with-afro… Best. Zombies. Ever.